The Liberty 3/8 in. 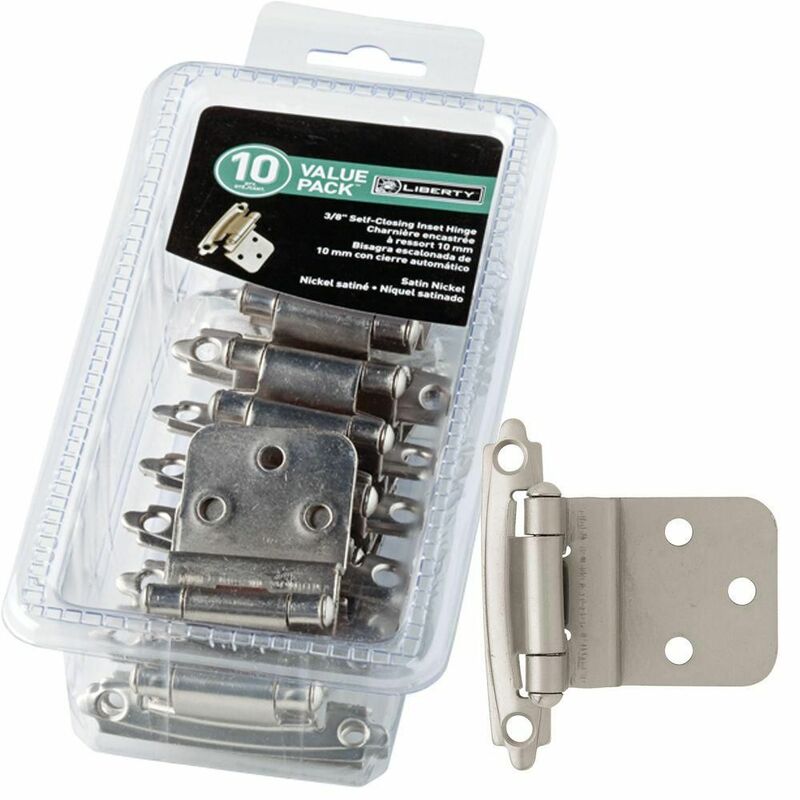 Satin Nickel Self-Closing Hinges (10-Pack) feature durable steel construction and a satin nickel finish that can complement most styles of decor. 3/8 Self-Closing Inset Hinge, 10 per package The Liberty 3/8 in. Satin Nickel Self-Closing Hinges (10-Pack) feature durable steel construction and a satin nickel finish that can complement most styles of decor. 3/8 Self-Closing Inset Hinge, 10 per package is rated 4.1 out of 5 by 63. Rated 5 out of 5 by sparky from Exactly what we needed to redo our old kitchen cabinets. Very happy with this product! Exactly what we needed to redo our old kitchen cabinets. Very happy with this product! Rated 5 out of 5 by Meredith from Good for cabinets that can't use European style hinges. Self closing feature works great! Nice ... Good for cabinets that can't use European style hinges. Self closing feature works great! Nice looking product and good price! Rated 3 out of 5 by Hairlinemiter from These are “economy” hinges. They will be fine for my... These are “economy” hinges. They will be fine for my application. Rated 5 out of 5 by Tige from Pretty, and fit the cabinets doors as measured. They are... Pretty, and fit the cabinets doors as measured. They are a very nice accessory to the look of the cabinets. Rated 5 out of 5 by Nana from I like the look and quality. I like the look and quality.